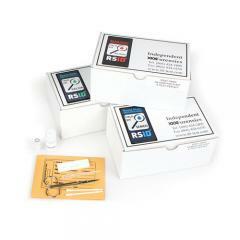 Lightning Powder RSID-70603 RSID Human Blood Field Kit - Box of 5 FREE SHIPPING! The confirmatory RSID Human Blood Field Kit from Lightning Powder contains all necessary equipment to identify human blood evidence at the scene of a crime. The test is human-specific and non-reactive with animal blood samples or other human bodily fluids. It is extremely sensitive, capable of positively identifying samples as small as 100 nanoliters. If a positive result occurs, the kit preserves and stores enough biological material to perform further testing back at the forensics laboratory, including DNA structural analysis to identify the blood's source. Each box contains five blood testing kits. ©2002-2019 CopsPlus.com: Lightning Powder RSID-70603 RSID Human Blood Field Kit - Box of 5 FREE SHIPPING!